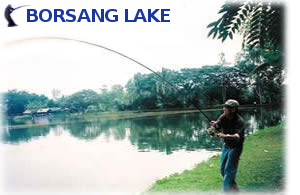 Below you can find information on fishing in Thailand in and around Chiang mai. We have guided Thailand fishing trips that cater for all types of angling and anglers. Carp fishing in Thailand for Giant Siamese Carp and Catfish fishing in Thailand for the worlds largest catfish species to adrenalin pumping topwater lure fishing for Giant snakehead and Jungle perch in many reservoirs surrounding the Chiang mai area in Northern Thailand. Mae Kuang Dam is a big reservoir, located 40 km northwest of Chiang Mai.We are fishing here for the Giant Snakehead (max.12kg) average size 2-3kg.